The glass ceiling—the barrier women face in advancing to the top of their professions—has been surprisingly durable. Women are 45 percent of total employees at the biggest U.S. public companies but hold only about 20 percent of board seats and 5 percent of the CEO jobs, reports the nonprofit Catalyst. The statistics are similarly skewed in Europe, according to a 2016 fact sheet from the European Union. The progress women were making several decades ago has stalled, data indicate. There was a rapid increase in the number of college-educated women working—from 1970 until 1990, since which point the gains have slowed, not only in number but in how much women earn compared to top-earning men. "The glass ceiling in today's US context can be summarized as follows: only 25 percent of college-educated women working full-time, full-year have earnings above the median of similarly educated men working full-time, full-year," wrote Chicago Booth's Marianne Bertrand. Only 6 percent of these women earn enough to match the top 20 percent of male earners. Only 3 percent make enough to match the top 10 percent of men. This situation, Bertrand noted, is inefficient. The numbers suggest there are many talented women who aren't being considered for high-paying jobs—depriving them of the rewards, and everyone else of their talents. 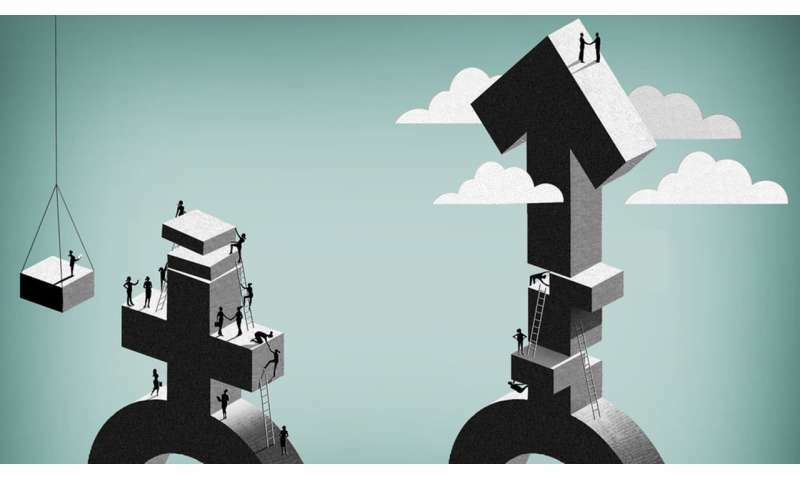 Falling barriers in the workplace have helped lift wages over the past 50 years, according to research by Chicago Booth's Chang-Tai Hsieh and Erik Hurst and Stanford's Charles I. Jones and Peter J. Klenow. But clearly barriers still exist. The #MeToo Movement has highlighted the impact of harassment, but several dozen research papers on the topic point to additional reasons, including persistent challenges in school, at work, and at home. The research indicates that to break the glass ceiling and see more women in high-paying jobs, we need to address these underlying issues. In some ways, women have made great strides since the 1960s. In the United States, women's labor-force participation rose from almost 50 percent in 1970 to almost 70 percent in 1990, according to Bertrand's review of literature on the topic. 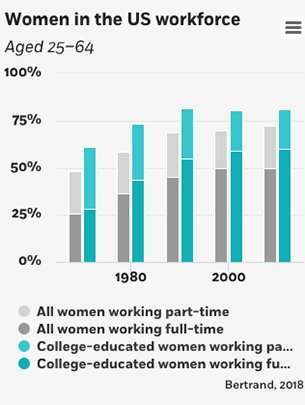 The share of women working full-time rose from 26 percent to 45 percent—and the share going to college rose too. Until the 1960s, college graduation rates were higher for men than women. Men's graduation rates have since hit a plateau, hovering around 30 percent, while now some 40 percent of millennial women are graduating college. "Hence, while much of the discussion about what is still holding women's earnings back in the labor market often assumes that education is no longer a relevant factor, this would be the wrong conclusion," Bertrand wrote. Take a group of people born in 1950. Women in this group studied subjects that produced mean earnings about 14 percent below those in the subjects chosen by men. They also pursued degrees and fields of study where women were almost a quarter less likely to reach the top 10 percent of earnings, according to Bertrand's analysis. The situation has improved a bit, but among people born in 1985, women still chose degrees that resulted in 6 percent lower mean earnings, according to Bertrand. Many groups recognize this issue and are encouraging more girls to go into fields that generate higher average earnings. There is an International Day of Women and Girls in Science, for example, and the National Girls Collaborative Project brings together academic, corporate, nonprofit and other organizations to encourage girls to pursue science, technology, engineering and mathematics. The National Girls Collaborative Project's Erin Hogeboom offers reasons girls might stay away from these fields of study, including messages received from mass media, educators, peers and themselves. "One of the things we talk a lot about is women's perceptions, which really stem from their experiences as girls and feeling confident and encouraged to pursue their interest in a STEM field," she said. Layers of messages build up, she said, giving some examples. TV shows portray boys being good at math. Some teachers, without realizing it, call more on boys than on girls in science classes. A girl who likes a STEM subject may find herself alone or one of just a few girls in a high-school or college class. And "boys are socialized to be less cautious around failing," said Hogeboom. If a girl doesn't feel like she's excelling in a STEM class, the heavy weight she feels to be perfect right away may be one more factor that causes her to pursue something else instead. But Bertrand wrote that female college students, in deciding what to study, could also be considering what challenges they expect to face in their careers. Women may be deliberately avoiding professions that are relatively risky and competitive, she said. In several lab experiments, women have demonstrated a lower appetite for competition with men. University of California at San Diego's Uri Gneezy, Stanford's Muriel Niederle, and University of Minnesota's Aldo Rustichini ran an influential experiment in 2003 in which they brought students into a lab in groups of six and asked them to complete mazes. They paid the participants in two ways: in some groups, participants were paid per maze completed, while in other groups, the participants essentially competed against each other to be the one person paid. Men and women performed equally well when paid the same, the researchers find. However, men outperformed women when the pay was made competitive. "The average performance of men increases, while that of women is not affected," the researchers wrote. Women, they added, "do not 'give up' when competing against men." However, when women competed against other women, their performance increased too. A later and closely related project by Niederle and University of Pittsburgh's Lise Vesterlund finds that women asked to solve math problems in a lab, when given a choice of how to be compensated, opted for the less-competitive payment scheme. This was true even for women who were better at math than the men were. Similar patterns turn up in data collected outside of a lab, as researchers document differences between genders in psychological attributes such as competitiveness. When Dutch secondary-school students in 2011 enrolled in a pre-university track, boys were more likely to choose the nature and technology option, while girls went for the humanities-oriented culture and society one—even though boys and girls were of similar academic abilities, and even when girls were as good at math and had better grades, according to Niederle and University of Amsterdam's Thomas Buser and Hessel Oosterbeek. Up to 23 percent of the gender gap in this study choice can be explained by competitiveness, according to the researchers, who measured competitiveness using an experiment that again involved offering more- and less-competitive payment schemes. This conclusion "lends support to the extrapolation of laboratory findings on competitiveness to labor market settings," wrote Buser, Niederle and Oosterbeek. In another project, women applying for jobs were less likely to apply for a job with stereotypically male associations if the posting mentioned they would have to compete with someone else for a bonus, or if the earnings were uncertain, according to research by Claremont McKenna's Jeffrey A. Flory, Monash University's Andreas Leibbrandt and University of Chicago's John A. List. But while studies support the theory that psychological traits are real and influential, there's debate among researchers about how much they account for the gap between women's and men's earnings and professional success. Moreover, these traits or preferences are likely malleable. "Nurture rather than nature may be responsible for women's lower willingness to compete as well as lower willingness to take risk," wrote Bertrand. "If nurture is indeed the dominant force, this further suggests that 'soft' policies that would reframe or recast certain educational and occupational choices to make them less threatening to women . . . may help undo whatever role these traits have in holding back women." But women have been shown to be more willing than men to accept financial penalties for workplace flexibility and thus are hurt by pay and management structures that both reward putting in office time and impose a career cost on flexibility. Princeton's Alexandre Mas and Harvard's Amanda Pallais studied people applying to work at call centers. Women, and especially women with young children, were willing to sacrifice pay to work from home and have a more accommodating schedule, they find. Similarly, a study of college students finds female students were more willing to accept lower pay for work flexibility, job stability, and a part-time option. The researchers, University of Wisconsin's Matthew J. Wiswall and Arizona State's Basit Zafar, suggest that gender differences in preferences explain a quarter of the early-career wage gap.